From the single malt scotches to the double-barreled bourbons to the premium vodkas, our remarkable liquor selection is a plethora of spirits for any occasion. From Glenfiddich Single Malt Scotch to Prichards Double-Barreled Bourbon to Ciroc Vodka, our liquor assortment is one of the best in Cullman. The Spot Beverages is dedicated to offering our customers a great variety with the highest level of knowledge and customer service. Whether you are in need of something quick for the tailgate party or the reception of a lifetime, our store has an abundance of superb options that are sure to satisfy and please everyone. If you need a recommendation or have a question, then please give us a call or you can go to the “Contact Us” page and fill out the form. Remember to check #cullmanliquorstore for the latest liquor specials. Due to the nature of this site, it is intended for adults of legal drinking age. Please drink responsibly. 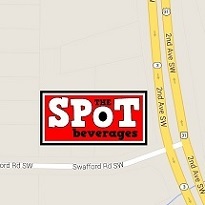 Copyright (c) 2014 The Spot Beverages. All rights reserved.